Pet Alert Decals are 4 in x 5 in and made of a strong weather-proof vinyl static cling material that will not fade with bright vibrant red color for high EZ alert visibility. Pet Alert decals will adhere to any clean glass surfaces without adhesive and can be placed on any inside window areas anywhere anytime and can easily be removed and reused again. 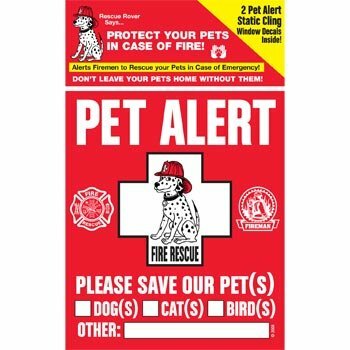 (Homes, Apts, Condos, Business, Rvs) Rescue Rover Pet Alert Decals are designed to alert firemen, police or neighbors that there is an animal or animals inside of property. Properly displayed, Pet Alert Fire Rescue decals greatly increase a pets chances of survival and being saved. It is our sincere commitment that through the widespread use of our lifesaving Pet Alert Fire Rescue decals, the number of tragic companion animal deaths due to fire or any disaster will be significantly reduced. Pets are like family and need to be protected. Dont leave pets home without a Rescue Rover Pet Alert Decal! Pet Alert Decal Instructions Directions: Select a high visible area on windows or sliding glass doors to place your Pet Alert decals to be clearly seen by anyone in case of emergency. Clean window area thoroughly before applying. Peel and remove protector paper and write in the selected blank box on decal, number of pet(s) that are inside that need to be rescued. Next place Pet Alert decal on inside of window area looking out. Press and wipe firmly to have static cling decal adhere to window and your done. For best results, use a fine point magic marker or pen.